Oh, you’re venomous. Don’t bite! Marty’s photo of the day #2691: In this photo from Costa Rica, I’m holding a brown blunt-headed vine snake. The snake is rear-fanged-venomous, but not deadly. Besides, why would such a cute little thing want to bite me? 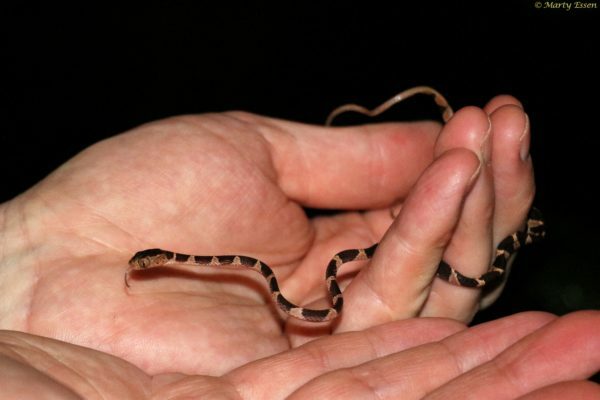 Actually, just like the venomous cute little banded coral snake from Borneo that actually did bite me, this one probably couldn’t have broken my skin. A different photo of this same snake appears in my second book, Endangered Edens: Exploring the Arctic National Wildlife Refuge, Costa Rica, the Everglades, and Puerto Rico.